Woo hoo! Log in to your dashboard and scroll down to the bottom of the page. You'll see the section called 'Transfer your number'. 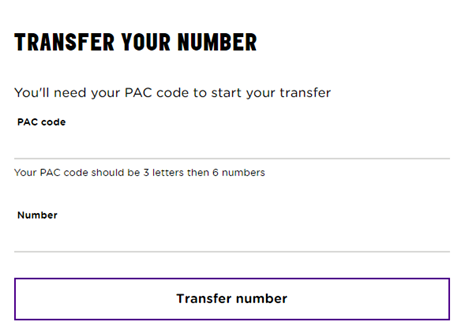 Simply enter in your PAC code, along with your existing mobile number (the one you want to transfer across) and it's done! You've started the porting process. If you've allowed the timescales for porting, and you don't think everything's moved across, try turning your phone off and on again. If that doesn't work, fire up a web chat and we'll look into this for you. Not requested your PAC code yet? Read our helpful guide on how to get the ball rolling with this.